Save on Invitations at My Natures Treasures, Page 2. Top brands include The Card Zoo. & The Card Zoo. Hurry! Limited time offers. Offers valid only while supplies last. 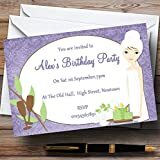 Purple Relaxing Spa Makeover Manicure Theme Personalized Birthday Party Invit.